Seephueak P., Phongpaichit S., Hyde K.D. 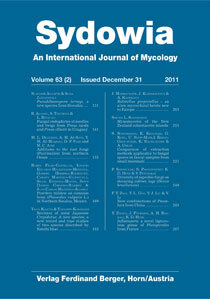 & Petcharat V. (2011) Diversity of saprobic fungi on decaying rubber logs (Hevea brasiliensis). The objective of this research was to study the diversity of fungi associated with the degradation of rubber tree logs (Hevea brasiliensis). Samples were collected during four periods in 2010: January (during the late rainy season), April (during the dry season), July (early in the rainy season) and October (during the rainy season) in Nakhon Si Thammarat and Songkhla Provinces, in southern Thailand. Each sample belonged to one of the following of three groups; newly fallen logs, middle stage decaying logs and old decaying fallen logs. Moist chamber, dilution pour-plate and sporocarp survey methodology were used. Fungal identification was based on morphological examination under compound and stereo microscopes. In total 461 species were identified from the decaying logs, comprising 384 anamorphic taxa, 46 ascomycota and 31 basidiomycota. Bactrodesmium rahmii, Botryodiplodia sp., Kirschsteiniothelia sp., Lasiodiplodia cf. theobromae, Paratomenticola lanceolatus and Veronaea coprophila were thedominant species occurring at all stages of decomposition. In addition, Bactrodesmium rahmii was the dominant species occurring during all seasons. Keywords: decomposition, lignicolous fungi, woody litter, rubber tree.